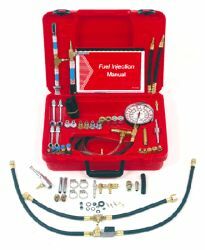 This set is a must have for the professional technician! The 3 1/2" gauge has a dual scale dial with ranges from 0 - 100 psi and 0 - 7 bar. It also has a relief valve and 6 ft. of tubing to relieve the pressure and the fuel safely. Also allows checking for sufficient fuel flow. The 4 ft. gauge-hose and gauge with a hook can be hung up to free the Technicians hands. The many adapters, hoses, and fittings cover most fuel injection systems worldwide. A time-saving Quick Coupler connection at the end of the gauge hose makes a speedy and efficient coupling possible with the adapters. This specially designed, compact, neatly arranged plastic blow-molded box makes storage easy.